Winter is the time for many varieties of citrus fruits to come around, but nothing makes me appreciate this more than the abundant availability of yuzu does. Citrus like lemon, orange, and grapefruit may be seen throughout the year (partly because they are almost always imported from a far land), but yuzu isn't; it is not impossible to find it in the middle of the summer if you search for it high and low, but your expensive, hard-won specimens are never going to be comparable to what you can see everywhere during cold months. And nothing makes me feel sorry to see the winter go more than when I start seeing less of yuzu, which often becomes more expensive as the weather gets gradually warmer and the day becomes longer. There are other varieties of Japanese citrus fruits that are only available during winter, but yuzu seems to hold a special place in my heart. So I always like to make the most of the fruit while I can, both in cooking and baking, but this year I have gone so far as to make my own yuzu marmalade. Which may perhaps be nothing special or even noteworthy for many of you, but I have never been an avid jam maker or eater. I think I've mentioned this before, but I'm not really partial to jams in general; I don't eat them much, so they are rarely be the first thing I'd make when I want to preserve seasonal fruits. Citrus marmalade is in fact the only category of fruit preserves that I can say I like to eat, but even so, I usually don't bother to make it by myself. So I don't know what got into me this winter, but I made yuzu marmalade not once, not twice, but a number of times in the past month, to see how I could make it more to my taste. While doing so, I've also made it with a bunch of different flavor add-ins, such as ginger, champagne, and chocolate - which was a big fun part. So even though I made it all in small batches, I still manage to stack up a quite few jars of yuzu marmalade of different flavors, and I thought I'd keep a record of what I did for a future reference. 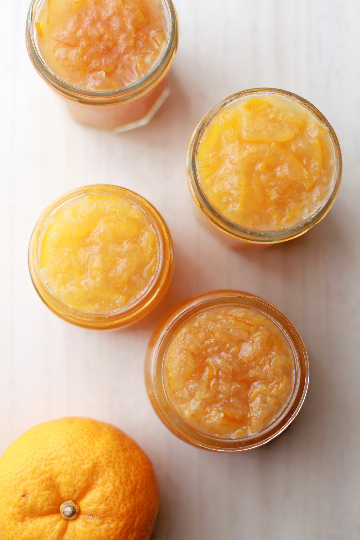 My variations of yuzu marmalade are all not overly sweet and taste really fresh. I use the whole fruit, peel and pith and seeds and all for a maximum flavor and minimum waste. Cooking time is fairly short, thanks partly to the fruit that cooks pretty quick. They are more on a looser side - not runny, but not as 'set' as many of more traditional marmalade high in sugar. The low sugar content means they are not suitable to long-term room temperature storage; they are meant to be stored in the refrigerator and consumed quickly. So I typically skip an 'proper' sterilization process but simply use very clean jars rinsed in hot water. 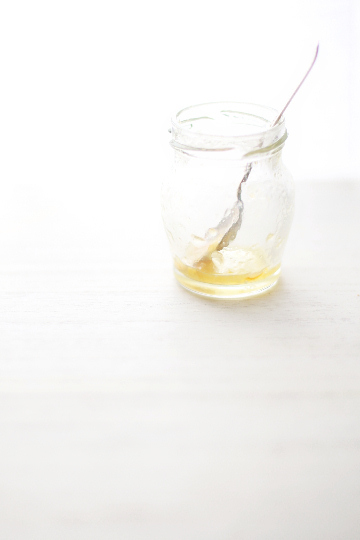 For a longer storage, you'll need to increase the amount of sugar and sterilize your jars properly. Now I won't pretend to be an expert in marmalade making, because I'm not. If you are new to marmalade making and are after 'standard' recipes, there are a plenty of them out there created and provided by more experienced and knowledgeable marmalade makers. But here is how I have done it and it has worked for me. Hope it will work for you as well, should you decide to make a good use of this long-loved citrus fruit of ours in a spreadable form. Light, fresh, bittersweet marmalade made using whole yuzu. To prepare yuzu, wash them thoroughly and pat dry with clean kitchen cloth or paper towel. Trim the stem ends and remove any blemishes or black spots on the surface. Quarter each yuzu with a sharp knife. Remove peel (with pith); this should be done easily by hand. Then squeeze out the juice and set aside. Separate all the seeds from the remaining membranes. Wrap the seeds in a piece of muslin and tie with string. (Alternatively, put them in one of fill-your-own-tea-bags.) Set aside until ready to use. 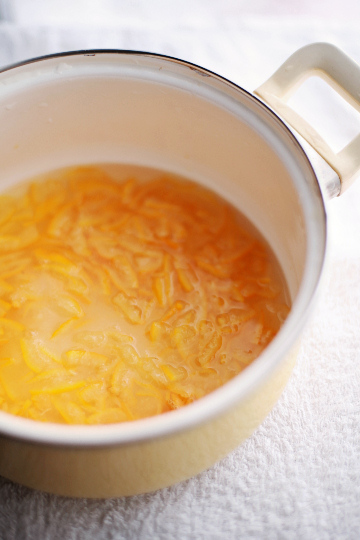 To pre-cook yuzu, place the membranes in a large saucepan and fill a plenty of water. Bring it to a boil and simmer for 5-10 minutes over low heat. Remove from heat and drain with a strainer to let cool slightly. When cool enough to handle, chop them roughly. Set aside. Meanwhile, using a sharp knife, cut the peel very thinly, about 1-2 mm (0.05-0.1 inch) thickness. Place the sliced peel in a large, non-reactive pot and fill with a plenty of water. Bring to a boil and simmer for about 5 minutes over low heat. Remove from heat and drain with a strainer. * The processes above apply to all of the variations of marmalade that follow. Now combine the precooked yuzu peel and membranes with the reserved juice and weigh. Then measure out granulated sugar so you have about a half the weight of the combined yuzu mixture. Place the combined yuzu mixture together with one-third of the measured sugar in the large pot. Cover with water so the content is just submerged. Add the reserved seeds in a pouch. Bring it to a boil and simmer gently over medium heat for 15-20 minutes, adding the remaining sugar in two additions along the way; skim the surface as you go and stir constantly. When the cooking liquid is reduced to one third and becomes slightly thick, remove from heat. Remove and discard the pouch of seeds. Leave to allow the marmalade to settle a little, for about 15 minutes. Meanwhile, rinse clean jars with boiling water and leave them to dry. While the marmalade and the jars are both hot, fill the jars with marmalade and cover with lid. Store in refrigerator and use within a month or two. You can make any quantity of marmalade, but I find it more manageable to make it in a relatively small batch. I'd often begin with 400-600 g (14-21 oz) yuzu to end up with about 500-750 ml (a little over 2-3 cups). For instance, when I used 400 g (14 oz) or 3-4 whole yuzu, the combined weight of the parboiled and drained peel and membranes and the juice was 470 g (17 oz)(not including the seeds); I used 200-250 g (7-9 oz) of granulated sugar and 200-250 ml (7-9 fl oz; a little more or less of 1 cup) of water for the final cooking. I had about 500 ml/ (a little over 2 cups) of finished marmalade. 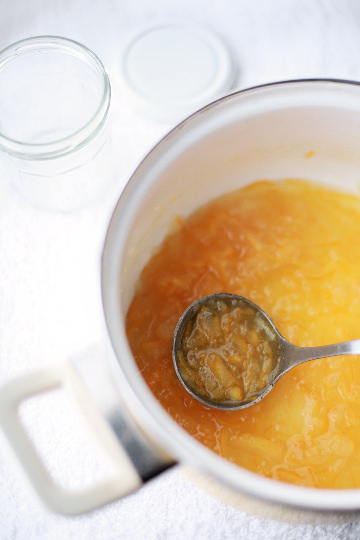 This recipe will make light, bittersweet marmalade; you can increase the amount of sugar up to the equal weight of the prepared yuzu for a sweeter (and more 'set') marmalade. 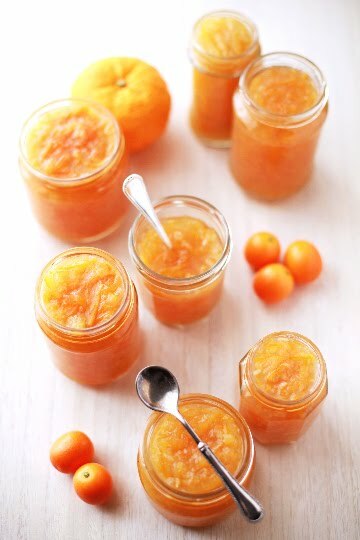 If time allows, leave the mixture of prepared yuzu with a pouch of seeds overnight before cooking marmalade to give pectin the time to be fully active, for a more 'set' marmalade. In any case, while this is not going to be a very 'set' marmalade, it still thickens considerably as it cools - more than other jams may usually do. So be sure to stop cooking before it reaches the consistency you'd prefer. I like to enjoy the bitter and sharp taste of yuzu in my marmalade, but if you would like milder-tasting one, try pre-boiling the sliced peel twice; cook it in a plenty of water for five minutes, drain, put it back in the pan and re-fill with water, bring it to a boil and cook for another five minutes. 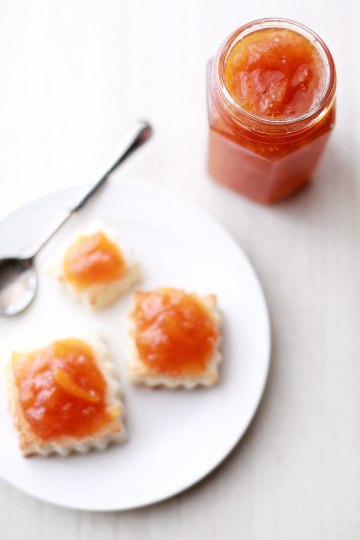 I also tend to like thin-cut marmalade for both its finer texture and shorter cooking time. Should you prefer chunkier one, slice the peel a little more thickly, and parboil for a little longer. Yuzu peel gets soft fairly quickly, but do make sure it's cooked thoroughly during the parboiling process; once sugar has been added to it, your peel is not going to become much softer. Marmalade cooked and jarred according to the method above is intended to be kept refrigerated and consumed within a short period of time (about a month or so). For information on thorough sterilization process for jars, please consult other sources. 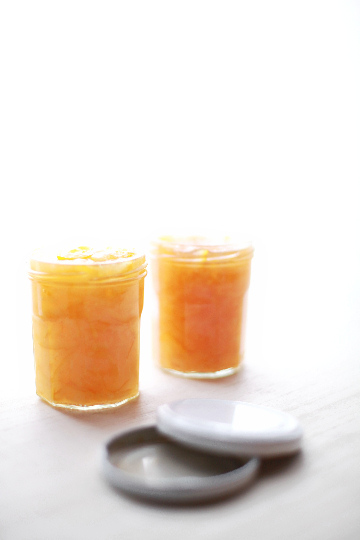 Now, if you have more yuzu than just for a few jars of simple marmalade, why don't you try and do something different? These are mostly made by the same method with different flavor additions. Pre-cook yuzu first, then try adding this or that like I did as below. Okay, this particular one isn't about adding a flavor, but it's a good way to make the most of yuzu you have - especially when you don't have a large supply. 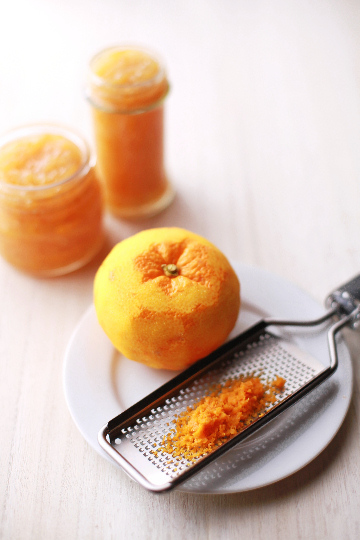 For most uses, you're likely to zest and juice yuzu, and that's it. But what you are left with will still have some flavor left, and instead of chucking it away, you can 'recycle' it as an ingredient of marmalade - or at least a part of it. The flavor will not be as sharp as that of an whole-yuzu version, but it still makes a fairly decent marmalade, and you could save some of what would otherwise have been thrown away. 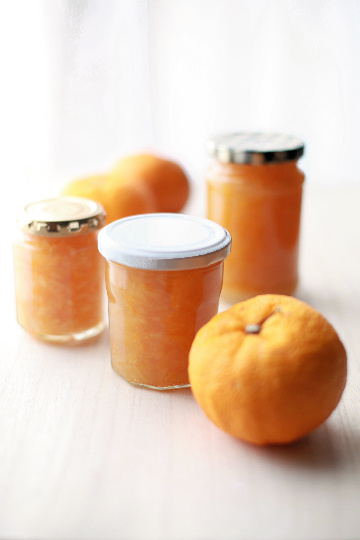 Simply substitute up to a half of the yuzu you use with 'used' fruit and follow the directions for the simple yuzu marmalade. Try perking things up by adding some spices such as ginger or cardamom; I added a bit of ground sichuan pepper. 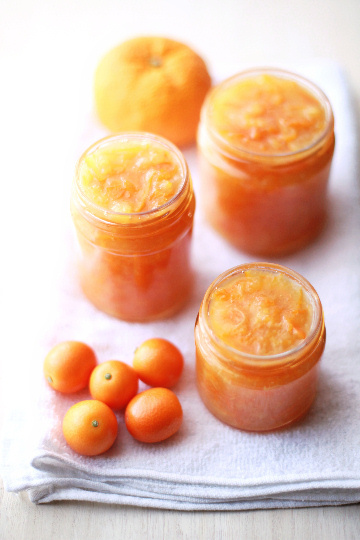 Yuzu after zesting and juicing may be stored tightly wrapped and refrigerated for up to two days before using it in marmalade. Did you know I like to pair everything with champagne? Well, I do, and marmalade turned out to be an excellent thing to use bubbles in. It would not add a clear-cut flavor or a radically different look to your marmalade like ginger or caramel would, but it gives a subtle layer of flavor - sweet, floral, or citrus-y. This makes truly fine marmalade. Good news is that you don't need to use expensive champagne, and leftover, flat bubbles can be used perfectly well. Follow the directions for the simple marmalade, and use champagne or some other sparkling wine in place of water. This will produce more foams than a one with just water, so skim them off carefully. Yuzu and ginger make a wonderful combination, and the idea of adding ginger to yuzu marmalade seemed only natural. I simply added finely chopped, blanched fresh ginger root when cooking the marmalade, but you could use freshly squeezed juice of ginger for a more subtle flavor and texture. Follow the directions for the simple marmalade; while parboiling yuzu peel, prepare ginger root by finely chopping a small piece of peeled fresh ginger root and blanching it in a boiling water. Try a tablespoonful of chopped ginger for every 100 g (3.5 oz) of the mixture of prepared yuzu and yuzu juice. Add the ginger to the yuzu and sugar, and follow the direction. Alternatively, grate a small piece of peeled fresh ginger root (a tablespoonful of grated ginger for every 100 g (3.5 oz) of the yuzu mixture) and squeeze out the juice. 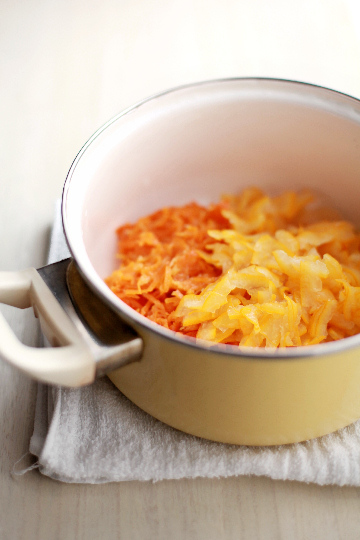 Make marmalade following the directions for the simple marmalade, and add the juice towards the end of cooking. I like citrus-flavored caramel, so why not caramel-flavored marmalade? I tried to find caramel marmalade recipes but did not find many - the only ones I came across was this one (burnt orange marmalade) and a recipe in this book (caramel orange marmalade). The first is to caramelize the marmalade as you cook it, while the latter is to make caramel separately and add it to marmalade. I didn't want to risk the entire batch of marmalade getting burned, so I went for the latter method. It made bittersweet marmalade with a bright amber glow. 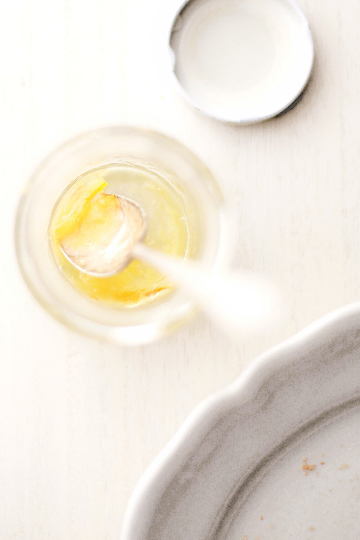 Follow the directions for the simple marmalade and prepare yuzu. Measure granulated sugar so you have a half the weight of the prepared yuzu. Add one-third of the measured sugar to the prepared yuzu alongside the seeds, cover with water and cook for about ten minutes. Remove from heat and set aside. Meanwhile, in a separate large pot, cook the remaining two-thirds of sugar with a bit of water (about 2 tablespoons for every 100 g (3.5 oz) sugar) over medium-low heat until it becomes light amber. Do not overcook. Remove from heat and immediately pour the reserved partially cooked marmalade into the caramel. Mix well until thoroughly combined. Place it back on medium-low heat and cook for 5-10 minutes until thick. Both yuzu and kumquats are glorious Asian citrus fruits that are only available during winter. Fairly bitter citrus as they are eaten fresh, kumquats mellow down dramatically as they are cooked, and they make wonderfully sweet and warm marmalade. You can of course make 100% kumquat marmalade, yet adding the bitter, sharp note of yuzu I think brings out the flowery sweetness of kumquats. I prepared kumquats separately from yuzu, which certainly gave me double the workload, and cutting up such a tiny fruit as kumquat was rather painstaking. But I can say my work was well rewarded in the end. Begin with kumquats twice or three times the weight of yuzu (for instance, 400-600 g of kumquats and 200 g of yuzu). 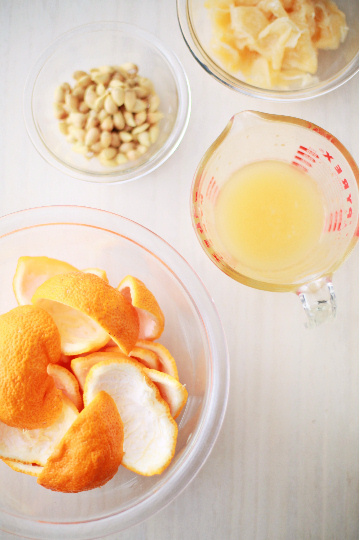 Prepare the yuzu following the directions for the simple yuzu marmalade. Meanwhile, prepare the kumquats: in a large pot, place washed kumquats and cover with a plenty of water. Bring it to a boil and simmer over low heat for 10-15 minutes; drain with a strainer and let them cool a bit. When the kumquats are cool enough to handle with hands, trim the ends off and remove the seeds, while separating the peel and pulp. Reserve the seeds together with the yuzu seeds. Slice the peel thinly and chop the pulp roughly. 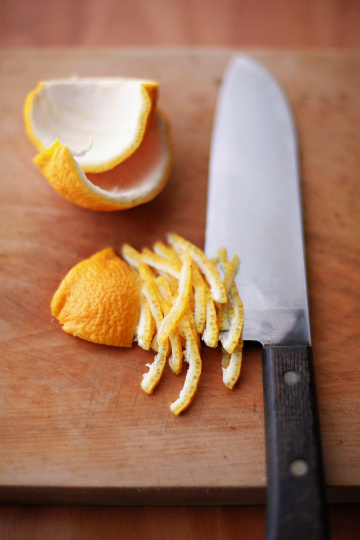 Combine the cut peel and pulp with the prepared yuzu peel, membranes, and juice. Weigh the mixture and measure out granulated sugar so you have a half the weight of the mixed pre-cooked fruits. Cook the mixture following the directions for the simple marmalade. Be careful when handling the parboiled kumquats. The proportion of seeds to add to the marmalade will be smaller than that of the simple yuzu marmalade; yuzu seeds are an important source of pectin that provides gel formation. 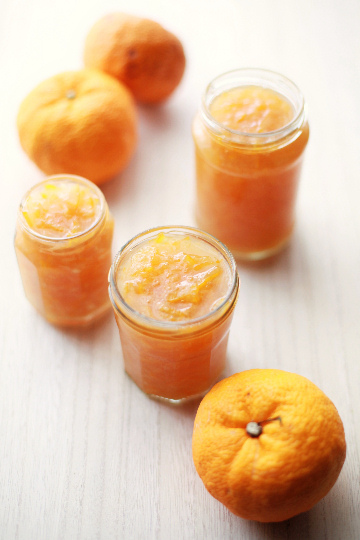 Add some extra yuzu seeds if you can to encourage your marmalade to set better. 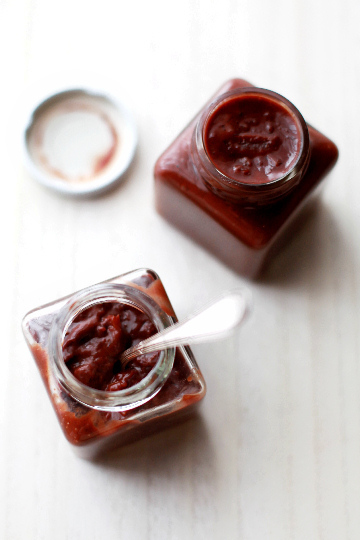 This is a variation of the fruit-chocolate spreads that I made a while ago; I'd made strawberry jam with dark chocolate and kumquat marmalade with milk chocolate, both of which turned out lovely. 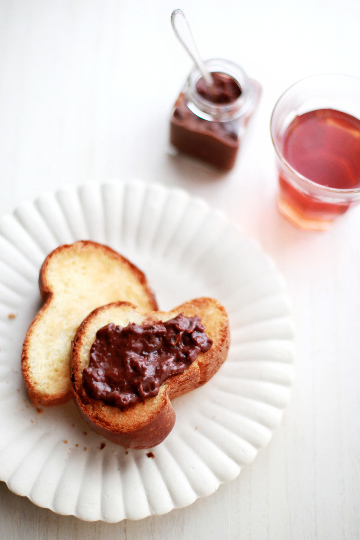 Here I did the same with yuzu and dark chocolate for a chunky bittersweet spread loaded with a bright citrus note of yuzu and a deeply rich flavor of dark chocolate. 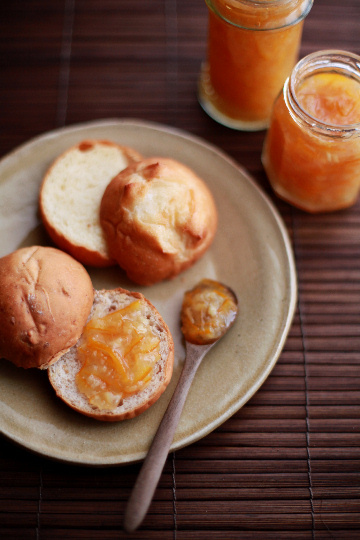 Follow the directions for the simple marmalade and prepare yuzu. Measure granulated sugar so you have a half the weight of the prepared yuzu. Chop about 22.5 g of good-quality dark chocolate per every 100 g of the prepared yuzu mixture (for instance, if your pre-cooked yuzu and juice weighed 400 g, chop about 90 g of chocolate; you can have a little more or less of chocolate). Add one-third of the measured sugar to the prepared yuzu, cover with water and add the seeds. Cook for about 15 minutes over medium-low heat, adding the remaining sugar along the way. Remove from heat and tip in the chopped chocolate. Mix until thoroughly blended. Leave to cool, then cover and refrigerate overnight. On the following day, place the yuzu-chocolate mixture over low heat and cook for five minutes, stirring constantly to avoid burning. Pour in sterilized jars and cover. Store in the refrigerator and use within a few weeks. The taste of this spread greatly improves when rested at least one day before use to allow the flavors to develop. It is also excellent with some spice added; I used cardamom by throwing a few crushed cardamom pods into the prepared yuzu mixture. Just don't forget to remove the pods before jarring the spread. 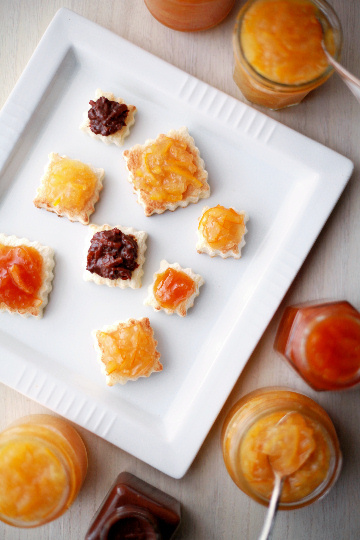 The recipe is loosely adapted from Mes Confitures: The Jams and Jellies of Christine Ferber (Christine Ferber, Michigan State Univ Press, 2002). ...wow, this is quite a lot of yuzu marmalade, isn't it? Among these variations, my favorites were yuzu-champagne and yuzu-chocolate, closely followed by the yuzu-kumquat one, though I do love the simple version. So while we are trying to make a dent in our vast overstock of marmalade through our morning place of bread or bowl of yogurt, I have also used them in baking and dessert making, to a large degree of success. 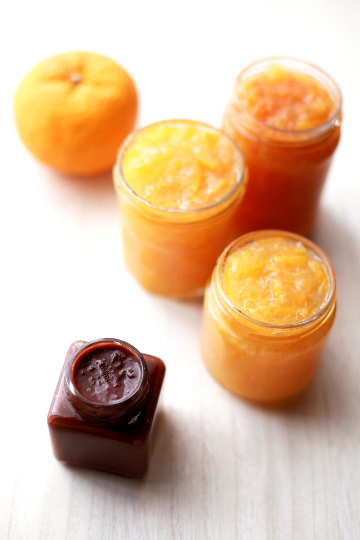 I'm hoping to share some of what I've been making with my homemade yuzu marmalade while the fruit is still around. Stay tuned! Fantastic! 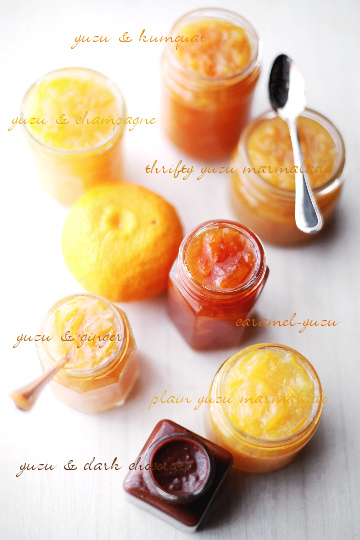 I love the photos and the variety of suggestions for yuzu marmalade. Beautifully done! Hello! I was so excited to read your post on yuzu! My mom and I are obsessed; whenever we are lucky enough to go back to Japan to visit her family, we are always looking for yuzu products to bring home to Seattle - usually bottled juice and freeze dried peel, but this last trip I found a jar of yuzu marmalade. Probably not as good as your homemade version, but better than nothing! When we're there, we use fresh yuzu whenever we can, since we know we won't see it again until the next winter trip. I've tried growing a couple of yuzu trees, but they are not so fond of the Pacific Northwest weather :). I'm going to keep trying - hopefully someday I'll have enough yuzu not just for cooking, but to have a yuzuburo at home on a chilly day! Thank you for your lovely blog! I used blood oranges to make the champagne marmalade and added a little cointreau at the end. Wow! Then I made the chocolate marmalade. Double wow! I have been adding a little cream to that and making chocolate marmalade sundaes. My friends can't get enough of this stuff!! If I ever get access to yuzu I will do it all again. We have 6 mature Yuzu trees in our garden and have made around 35kg of Marmalade using your basic recipe. Added sugar as we went, to taste. The final part was adding the chopped peel before putting into conservation jars bought cheaply from Ikea. 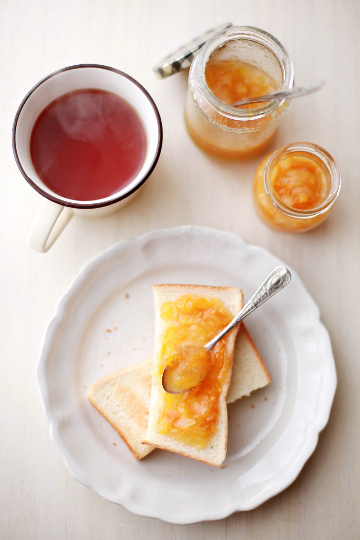 We love Yuzu marmalade. A friend in the UK who we sent some to says the zing of the Yuzu tastes fizzy! Anyways, thanks for the inspiration!